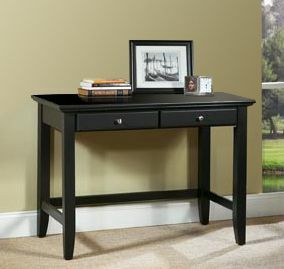 Stylish and practical, this writing desk from Home Styles is a terrific focal point for any contemporary office. This piece comes designed with a classic brown finish, perfect for pairing with a variety of decor. Its sturdy solid wood frame provides your work space with support and lasting durability. Your workspace will be compact and organized with this desk, which has enough space for a computer, notebooks, and more. Innova conjugates working and living with style. It offers various storage possibilities for an organized work environment. The L-shaped desk offers one utility drawer and one file drawer with letter/legal filing system. One lock secures both drawers. The hutch offers paper shelves, close and open storage and a rubber strip for wire management to keep your work surface organized. Fully reversible unit. Finished back. Modern style meets academic practicality with this fun 3pc juvenile desk set. Featuring a writing desk with a storage drawer, a bookcase with 2 adjustable shelves and a multi-purpose cart perfect for storing a printer, school text books or even game devices. Finished in a classic white color, this 3 pcs set arrives ready to assemble in one box and will be a great addition to any child's bedroom. Bedford 42-inch x 30-inch x 24-inch Standard Writing Desk in Brown Stylish and practical, this writing desk from Home Styles is a terrific focal point for any contemporary office. This piece comes designed with a classic brown finish, perfect for pairing with a variety of decor. Its sturdy solid wood frame provides your work space with support and lasting durability. Your workspace will be compact and organized with this desk, which has enough space for a computer, notebooks, and more.